This mural was based on a tree outside the kitchen window where birds like to perch and sing. Also, the house is located in a canyon in the Hollywood Hills that is in the flight path of the annual Monarch butterfly migration, so once a year there are thousands of butterflies passing by. 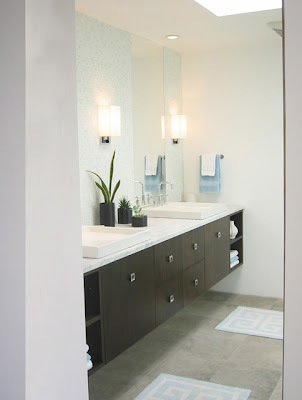 Custom walnut cabinets and Carrara marble counters were added as a finishing touch. Much more traditional than Jill's usual style, but one of her favorite rooms. 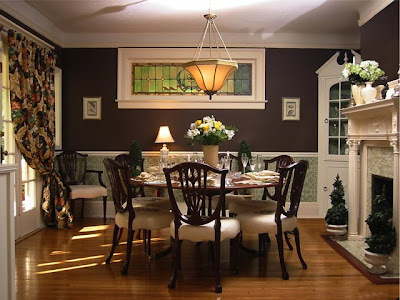 Very budget-minded redo, she recovered clients' chairs, added chocolate paint, chair rail moulding and wallpaper below, new drapes, light fixture and table. 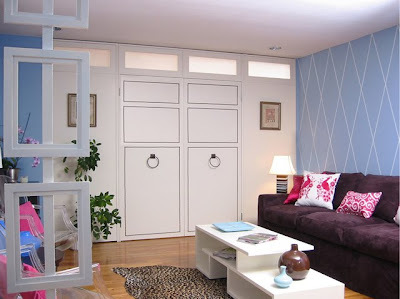 Painted existing built-in china cabinet, added new cornice to cabinet to make it more elegant and proportional. This is Jill's own living room. The octagons are a painted mural of her own design, not wallpaper. The only newly made things in the room are the custom white leather chairs (not visible in this view) and the rug, which is Kashmiri goat fur. Pretty much everything else in the room is vintage: sofa reupholstered in lemon velvet, owl coffee table, teal Paul McCobb stools, olive burl credenza by Mastercraft, end tables, lamp, Milo Baughman chrome chairs, artwork, op-art needlepoint pillow on left, Blenko glass decanters and most of the white ceramic animals (except horse on credenza by Jonathan Adler.) The Happy needlepoint pillow on right is also from Jonathan Adler (I love the tongue-in-cheek vibe). Even the taxidermied crow and peacock are vintage. 2 things Jill often does in her work is to play with scale (the octagons are 4' across) and add something with a little edge. Jill states, " I love this room because I find it impossible not to feel happy sitting in it"! Another budget redo. The house had a living room and den completely open to one another and her client wanted to use the living room while the teenage kids watched TV in the den, so she made over the living room and added the studded doors with clerestory windows to seal off the den. The screen in the foreground was added to give a little sense of arrival, as the front door opens directly into the living room. 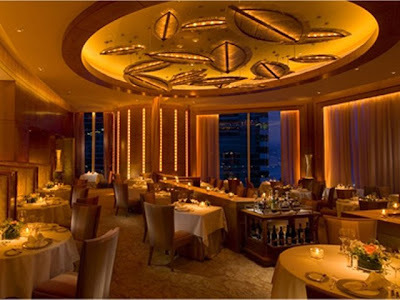 This is Nicholini's restaurant at the Conrad Hotel in Hong Kong. (Conrad is the 5-star division of Hilton hotels.) Nicholini's is considered one of the best Italian restaurants in Hong Kong. For the redo, Jill designed the leaf lighting at the ceiling, and the lit columns (each line is a row of glass abstract butterfly shapes with backlighting). 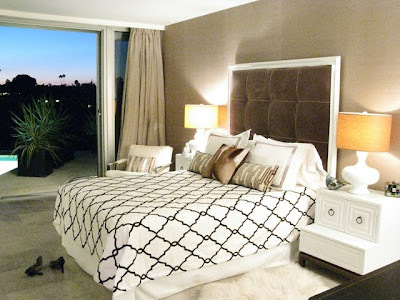 She also added custom carpeting, and all new furniture, drapery and wall treatments. Jill partnered with Texeira Design to achieve this exotic and romantic atmosphere for the ultimate in fine dining. Bar 1912 is a new addition to the famous Beverly Hills hotel, home of the Polo Lounge. The hotel owners wanted to create a new hangout that would update their image and attract a hipper celebrity crowd, but of course still wanted it to feel as if it belonged in the classic hotel. Working with Texeira Design, Jill tore out an existing boardroom and suite to create the bar and an outdoor patio area. Virtually everything is custom: rug, walnut and onyx bar, furnishings, artwork, plaster relief wall behind the bar. 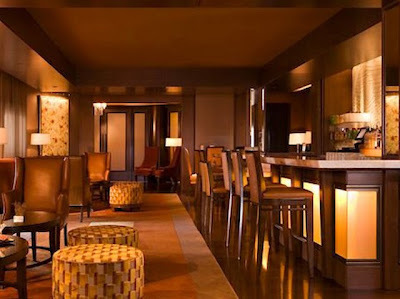 Forbes magazine named this one of the top 10 hotel bars in the world. 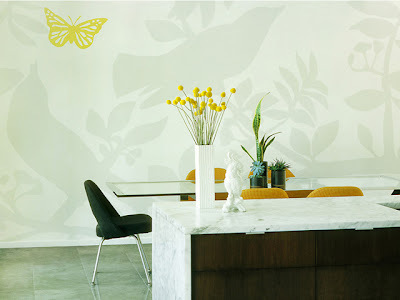 Jill Crawford is a Los Angeles-based interior designer and graphic artist. Over the past 10 years, Jill’s passionate pursuit of interior design has resulted in noteworthy achievements in spaces from homes to hotels, pads to post-production facilities. Her singular style is derived from a fine arts degree from Barnard College in New York City and an unusual career path that began with producing award-winning news programs for National Public Radio. Yearning for a more visual medium to work in, Jill moved on to Lucasfilm/Industrial Light & Magic in northern California. With her unique style and reputation as a perfectionist already emerging, she pursued the challenges of set construction and art direction for film and television. But it was the interior spaces of the urban landscape that became her ultimate calling. Solicited for residential, commercial and 5-star hotel projects all over the United States and Asia, including the new Ritz-Carlton Denver, the remodel of the Conrad Hotel in Hong Kong, the nightclub Deep in New York, and Bar 1912 at the Beverly Hills Hotel, which was named one of the world’s 10 best bars by Forbes magazine. Jill’s talent for interiors was soon noticed by television producers at the Style network, where she became the lead designer for the the home makeover program “Guess Who’s Coming to Decorate.” Jill currently resides in Sherman Oaks with her husband and Weimaraner. Jill's current specialty is large-scale graphic design for walls. Each wall is a piece of custom installation art, personalized and tailored to each individual client and space. 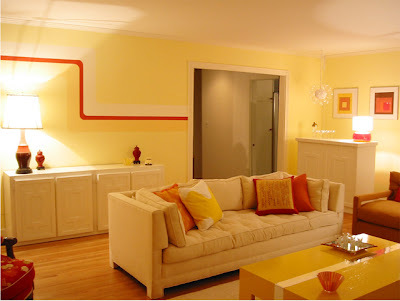 Walls may be painted, texturized, applied vinyl, embedded with objects, silver-leafed or a combination of the above. Works are also available on canvas for clients who would like to take their murals with them when they move. It has been my pleasure introducting you to Jill Crawford and her unique and elegant style of designing.